Bitbucket passed the R&S lab! 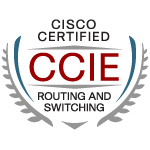 Head over to his site listed in my CCIE Blog links and send him a big congrats! I remeber when I first emailed him about his site and he replied about sharing knowledge and so forth. I just had to lol, thinking you are way a head of me man, you don’t want to be infected by me! Well I got brave and upgraded my Tiger to Leopard. Was pretty painless and was relived to see that my Dynamips was still working after the upgrade. All the bridge connections out to my four switches were still running properly. I had a small quark with IPv6, but I think that was more a “me” issue. Leopard itself though seems very buggy with slow shutdowns and such. It really needs some bugs worked on which surprises me coming from Apple. I would expect this from Microsoft, but not these guys. Although not as broken as Vista it is still a small bit of mud on their face. Well I got through all the BGP and IPv6 cod material. I actually read more on IPv6 than watching the classes. The classes seemed to make some matters worse instead of helping! I am also changing my plan around a little. I have been doing the topics in the cod material and then going to work on them in workbook I. Problem is it is slowing me down tremendously and I can’t remember what I did in Lab I a while ago. So from this point forward I am planning on just finishing up with the cod’s and then going to work on workbook I quickly and then starting on workbook II. On that note I am going to finish the security cod today and move on from there. I also am going to have to reschedule my lab date and push it back some. My wife is trying to get pregnant(which she may already be), so I will have to make sure I am home for that :). Right now June 30th 2008 would be cutting that awfully close. Another month of preparation will not hurt either. Thank you for registering for the CCIE lab exam-the final step in attaining the industry’s most rigorous and highly-respected IT certification. This confirms your reservation at our location in Research Triangle Park, NC and provides information on the exam, payment options and cancellation policies. Please keep your contact information updated in our database so we can notify you of any changes. You can review and edit your information online at: http://www.cisco.com/scheduleccie. Phew I am Glad October is Over! Â Â Â It has been a long month, with work and everything else in real life happening it has been a slow month for studying. Thankfully outside of an exchange migration at work it seems I will be back on track starting next week. I still have the rest of BGP to finish up and to move on with. I would like to finish up the rest of the COD’s soon so I can move on to WorkbookÂ II. I will probably order my printed copies of the workbook and answer set this week as well. Hopefull Internetwork Expert won’t be updated version 4.1 soon! Hopefully I will have more posts going up every where days.